Yasuda Women's University student Nayu Hattori is dressed in her kimono by Pitt alumnus Evan Mason (left, A&S '15) and Katsuko Shellhammer (right), educational outreach coordinator for the Japan America Society of Pennsylvania. 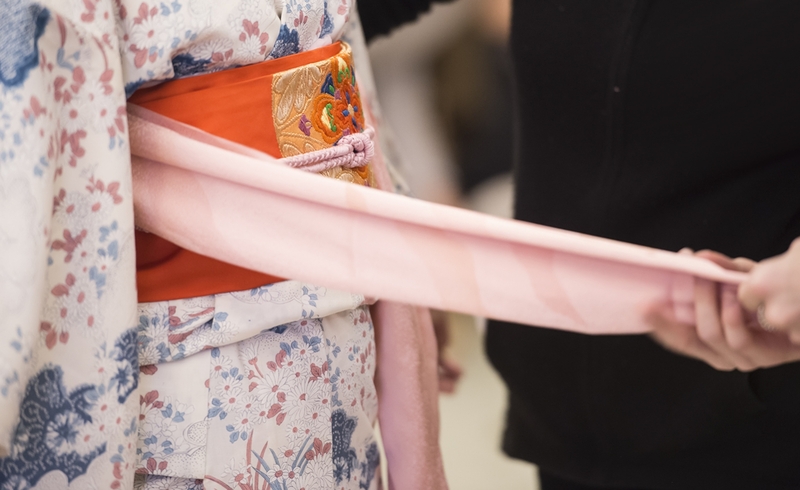 Sashes, cords and colorful silk fabrics make up a Japanese woman's kimono. 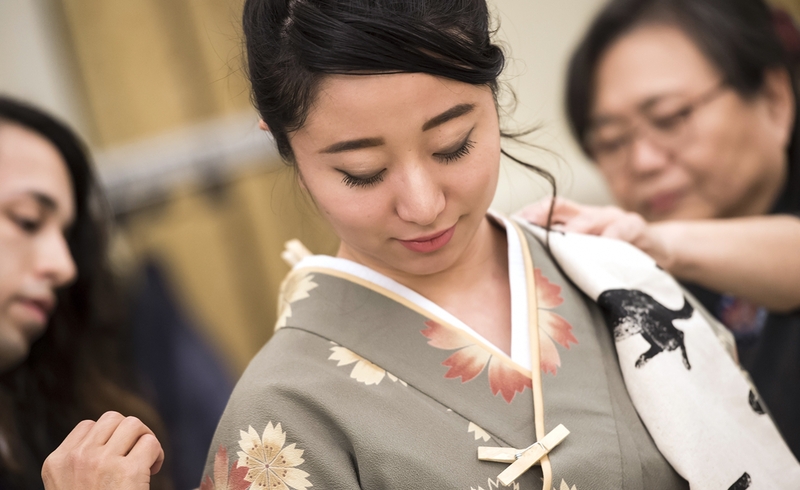 Pitt Graduate School of Public Health student Hiroko Henker (left) and Evan Mason (right) add the finishing touches to Haruka Moriguchi's (center) outfit. Visiting Japanese students wait to attend their Coming of Age ceremony at the University Club. Participants snapped countless photos and selfies of the events to share with friends online. 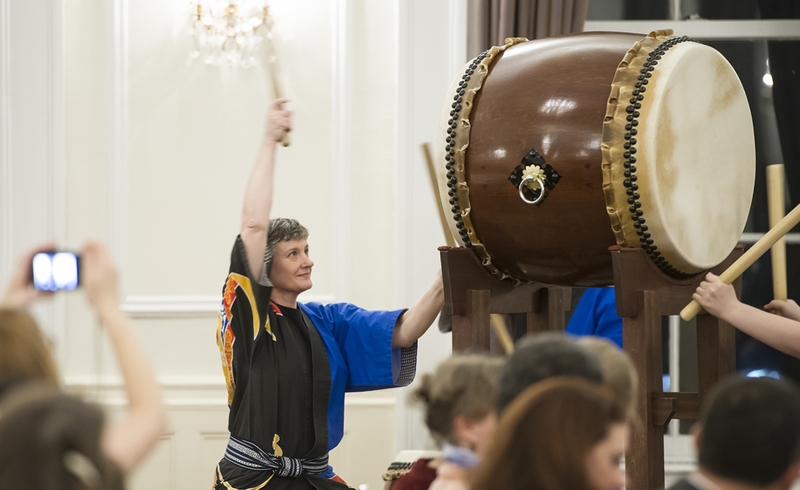 Percussionist Erin Kelly, who is part of the local drumming group Pittsburgh Taiko, entertained the crowd as the ceremony began. Most of the Japanese students hadn’t packed colorful and elaborate kimonos in their suitcases when they came to Pittsburgh — they were limited to carrying one bag apiece. The age of 20 is considered the beginning of adulthood in Japan, and the national holiday — with roots dating to 714 A.D. — officially recognizes this transition in grand style. Preparations for the Pittsburgh ceremony began in the early afternoon of Jan. 10 as the women began arriving at the University Club’s Gold Room to be dressed in silk kimonos. Kimono dressing, or kitsuke, is an art unto itself. Pitt alumnus Evan Mason, who graduated in 2015 with a Bachelor of Arts degree in Japanese and anthropology, is an expert and scholar of kitsuke. He joined several Japanese women from the Pittsburgh area in quickly and efficiently outfitting the women by wrapping, tucking and folding the kimono’s colorful silk layers. The first step is an under-kimono. A narrow sash is put through a wide loop that extends from its collar and wraps around the body. Then, the main silk garment is put on and the length adjusted. Wooden clothespins are temporarily clipped onto the garment as at least three narrow sashes are wrapped around the body and knotted. The stiff sash called the obi is wrapped around the middle of the body with another layer and sash on top. Then, more tucking and smoothing out of the fabric. Next, the musubi, the decorative bow on the back of the garment, is knotted in place. It took three people nearly 30 minutes to outfit one woman. As they finished being dressed, the women retreated to a nearby alcove to do their hair and makeup, some applying colorful hair ornaments. “Now I feel more confident,” Yasuda student Nika Tanimoto said at the ceremony. Participant Aarthi Pookot, a Pitt freshman majoring in Japanese, demonstrated Japanese calligraphy on a large banner. “I wrote ‘Congratulations, new adults,'” she said. Though many of the participants chose to wear kimonos, others opted for dressy Western-style attire. 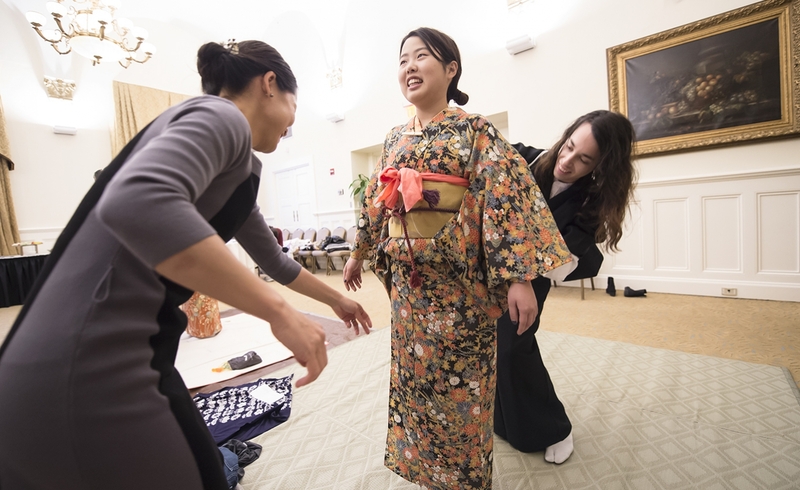 In addition to the Yasuda students, Pitt students who are learning Japanese and Japanese exchange students at Chatham University were encouraged to take part. The students each walked to the stage and accepted a small gift. An easel in the room displayed a large photo of a cherry blossom tree, its lower branches bedecked with pink ribbons, that was planted in Pittsburgh’s North Park by members of the Pittsburgh Sakura Project as a gift to the visiting students.